ARE YOU A CREATIVE, PURPOSE-DRIVEN ENTREPRENEUR, COACH OR CONSULTANT LOOKING TO GROW YOUR BUSINESS BUT ARE JUST NOT SURE WHERE TO START? You know you need more leads and clients but don’t know how to do it quickly? Maybe you’ve thought about taking your message to a wider audience but are not sure how? Perhaps you’re feeling overwhelmed – spending hours working in your business but not getting ahead … or reaching all of the people you know need your help … or maybe you’d just like to spend more time with your family? If you’re a conscious, creative entrepreneur I know you just want the freedom to do what you love and to do more of it, spreading more of your special brand of joy … but to do that you need others to love the work you do (i.e. a brand) … and income so you can keep doing what you love (a business). If any of these things seem familiar, take a deep breath in … and let it all the way out. You’re in the right space and I know exactly how you’re feeling, I’ve been there. I know what its like to build a business the hard way … and the easy way. I know what you need to do to turn what you love into an income. In fact, that’s where I come in. I BELIEVE WE’RE HERE TO LIFT EACH OTHER UP WITH THE SPECIAL GIFTS WE HAVE BEEN GIVEN. I HELP YOU ARTICULATE AND SHARE YOUR GIFT WITH THE PEOPLE WHO NEED IT MOST. 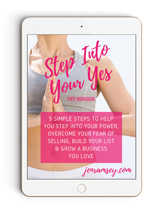 My name is Jen and I help creative, conscious entrepreneurs generate more leads and “yes’s” (aka sales) by helping you clarify your offering, connect with your tribe and grow your business. If you are successfully working or coaching people one-to-one and want to expand your business I can help you with that too. My gift is to help you connect your inner yes (your passion and genius) to your outer yes (the way you solve your clients’ problems and serve them). In the mainstream they call me a business, branding and lead generation strategist and I’ve worked with clients ranging from start-ups through to household brands. Here I call myself a “yes” facilitator – I help you find your inner yes and create the solution that will have your clients say yes to you. Today I’m more aligned with yoga, meditation and conscious business than the corporate boardroom, but from my 20 years experience in corporate marketing, communication and facilitation I know exactly what’s needed for a business to grow, thrive and scale. In fact one brand I built was later sold for $27 million. NOW I’M ON A MISSION TO HELP CONSCIOUS ENTREPRENEURS WITH A BIG HEART TO SCALE AND REACH MORE PEOPLE. WHY? BECAUSE MORE CONSCIOUS ENTREPRENEURS BUILDING MORE CONSCIOUS BUSINESSES MEANS CREATING A MORE POSITIVE, HAPPIER AND HEALTHIER PLANET. IF WE DON’T ACT NOW, AND TAKE REAL ACTION WITH THE GIFTS WE’VE BEEN GIVEN THEN WHO WILL?